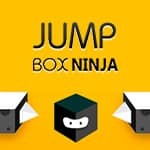 the Ninjia in shape where should overcome all traps in Jump Box Ninja and reach the top. Whether you can receive the maximum rating? Earn diamonds to open new heroes.